Leslie Mann’s modest shopping day outfit is proof that you need not expose an indecent amount of skin to look younger. The 42-year old actress’ ensemble is becoming on her, giving her a fresh and clean vibe that belies her age. Accompanied by her The Other Woman co-star, Kate Upton, Leslie was out about in Paris a few days ago wearing a black and white accordion-pleated skirt. 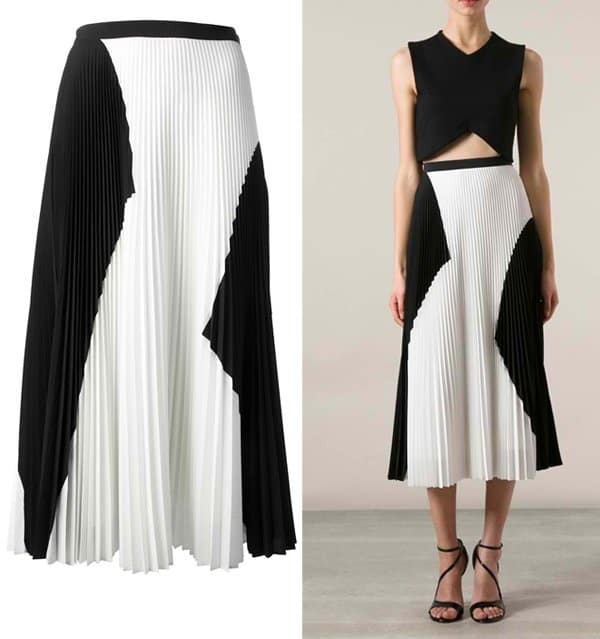 The skirt looks so feminine with its tea-length structure, micro pleats and black and white color combination. Let’s just say that the romantic air of Paris got to her because she teamed this up with a sweet-looking bow blouse, a cropped cardigan and a pair of scalloped flats. Just pair up a pleated midi skirt with a bow-adorned blouse and then throw in a light cropped cardigan. Keep it comfortable in a pair of flats and put your hair up in a high updo and you are great to go!